We provided our service at the wedding performed at Kamigamo Shrine early this morning and the wedding reception at Sakurai (ryoutei restaurant) after that. Before the wedding ceremony, the bride expressed her gratitude to her parents in the dressing room. I heard her words behind the door. Each word was filled with her sincere thankfulness. It’s one of the most precious moments in your life when you tell “thank you” to your parents before the wedding. I was so touched and found myself close to tears. 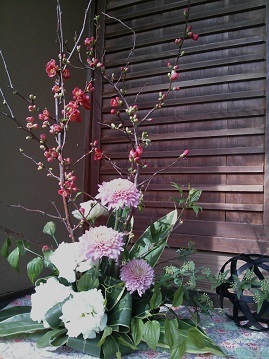 The flower arrangement with “ume” (Japanese plum) was very beautiful and matched the image of the couple. Congratulations on your wedding, S-sama and K-sama!